When a critical server crashes in most businesses, an alert email is sent out, often to a group of people, in the hopes that someone will look into it. But who should handle the problem? What if they are unavailable? Or what if no one was checking their emails? A crashed site can result in lost revenue for a company but the problem of alerting the right people in the right way was traditionally only available to large enterprises. PagerDuty is a new Toronto startup that aims to solve this problem through their newly launched web application at PagerDuty.com. Started by former Amazon employees, the newly launched (and currently free) beta service is a well-executed, easy to use to solution to a common and costly problem. I love how it works. To use it, you sign up using a one-page form, and you’re then set up with your own account (accounts are free during their beta, but it’s not clear how long they’ll be in beta). You then set up your own alert software to send emails to PagerDuty whenever you want a notification (this is the most time-consuming part because you’ll need to set up each monitoring software individually). PagerDuty doesn’t do the actual monitoring; rather, it receives alert messages via email and routes them to the right person on your team based on rules you build. Alerts can be in the form of SMS, phone calls, or email. One of my favourite parts of the software is the great UI on the built-in calendar that allows you to set up which person on your team is on-call at any time. The team had the option to possibly start up PagerDuty somewhere in Silicon Valley, but in the end, they chose to start in Toronto because of reduced costs and the fact that they had a better network here. “the Valley wasn’t really an option for us. We chose Toronto because all of us grew up here — most of our network is based here, so it really made sense to try not to stray too far from home,” says Solomon. 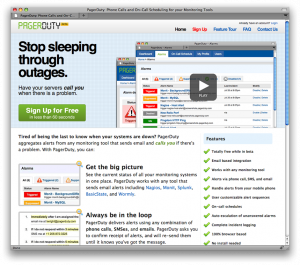 PagerDuty has done many things right. The website looks slick and the UI is smooth. (Some have commented that the front page may look a lot like some other Web 2.0 startup websites but that’s probably a good way to start, in my opinion). The problem they deal with is a real one that their team has experienced in the past, and they’ve solved it elegantly. Some of the challenges I expect they’ll have is that the market will be limited to a specific segment of companies that already use server management utilities that send emails – marketing to the right people in these companies and gathering enough adoption will be a challenge at least in the beginning. PagerDuty founding team is Alex Solomon, Andrew Milkas, and Baskar Puvanathasan. You can learn more about PagerDuty’s service and sign up for a free account on their website at PagerDuty.com. I’m going to try using the service at my company. Representing the 2006 UW Class of Software Engineering! I think the job done by team of alex solomom is very noble. They were very generous to share their knowledge on addressing problems commonly encountered by most businesses. This is truly a breakthrough and I hope they will expand in other parts of the globe. To the team who created PagerDuty, KEEP UP THE GOOD WORK!!! The Costa Rica HQ salutes you.